KIEV, Ukraine -- Local elections in Ukraine on Sunday will be a test for Viktor Yanukovych and his understanding of democracy. Accusations are already flying about fraud and possible election rigging. 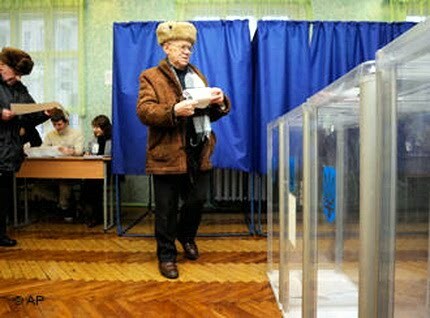 Almost 50 percent of Ukrainian voters do not rule out manipulation. Just a few days before regional and local elections in Ukraine, President Viktor Yanukovych addressed governors in a TV show in order to make sure they will work to ensure a fair election. "I will prosecute any attempts to tamper with election results with the utmost severity," Yanukovych said. But Yanukovych already had to react to accusations when members of the opposition Fatherland party discovered 130,000 allegedly forged ballot papers in a printing house in Kharkiv, a city in Ukraine's East. Yanukovych told federal prosecutors to investigate the case. The ballot papers were a "special reserve" which had to be printed as required by law, said prosecutor Yevhen Popovych later. According to the director of the printing house, however, the ballot papers were simply part of a test print. Yulia Tymoshenko, the head of Fatherland, said no one could rule out that fraudulent ballot papers like the ones in Kharkiv might turn up in other areas of Ukraine as well. "There is no limit to what these people will do. They will falsify the vote, you can depend on it," she said. Several opposition parties have announced that they found tens of thousand of forged ballot papers in two other towns in western Ukraine. They also warn about the use of "administrative resources" by Yanukovych's party, called Party of the Regions, including using state-owned vehicles to increase voter turnout or mobilizing voters, who work in government institutions and businesses. The communists are also raising concerns over Yanukovych, although they are technically in a coalition with his party and a bloc headed by parliamentary leader Volodymyr Lytvyn. Members of Yanukovych's party could interfere with communist party candidates in the eastern regions of Donezk and Luhansk, according to communist leader Petro Simonenko. He said he suspects that on orders from Kiev, "devised reasons" are found to block communist candidates, thus ensuring that Yanukovych's party gets at least 60 percent of the votes. Yanukovych has said his party is so far ahead in the polls and its record so solid that there would be no reason to tamper with the election results. But opinion polls show that Yanukovych's party has lost support since the presidential election at the beginning of this year. Experts at the Open Society Institute put the blame on campaign pledges that have not been fulfilled. Yanukovych had promised to improve transparency and give tax benefits to small company owners. Ukrainian voters are also resentful of a drastic increase in the price of gas, which in turn has led to higher prices for staple foods and public transportation. Therefore, opposition parties like Tymoshenko's bloc are expected to gain votes. According to the Open Society Institute, other parties, such as Strong Ukraine and Front for Change, will also benefit from voter dissatisfaction. According to a poll by the Democratic Initiatives Foundation, a Ukrainian NGO, almost 50 percent of those interviewed do not think the elections will change anything. Positive change is expected by one third of the interviewees, while four percent expect a drastic change for the worse. Only two percent believe that the candidates are going to fulfil their campaign promises. Still most of the interviewees - three quarters - will go and cast their vote. But only 8.5 percent believe the election results will not be manipulated. LOCAL ELECTIONS SHOULD BE OF LOCAL CONCERN--NOT THE PRESIDENT!! Despite what many may say "yes" there may be some local voter problems as anywhere but Ukraine President Yanukovich would not have good reason to involve himself with these elections. closely and nationally by voters.. They will however, show basic thinking and trend of the people in UKRAINE.